Sweet potato kheer recipe – As the name says, It is made from sweet potato. 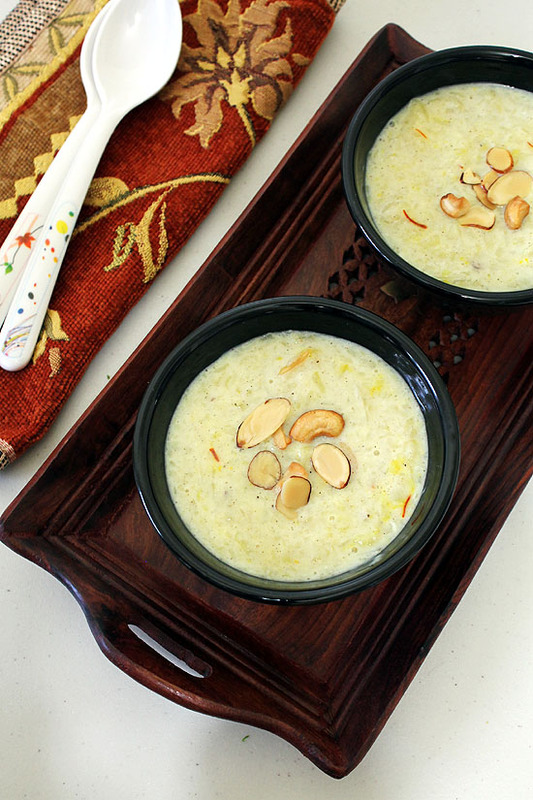 Milk and sugar is used just like any other kheer recipe. Since this vegetable has already slightly sweet taste, we will be adding very little sugar. Sweet potato is called shakarkandi in Hindi and so this recipe called shakarkandi kheer. This is one of the tuber vegetables. So it is allowed during the Hindu fasting or vrat. So this kheer can be consumed during the vrat. When it comes to sweet potato, I usually prefer just plain, boiled or steam one. On occasion I make sweets like this kheer or halwa, ladoo. During this cooking process, grated sweet potato will cooked till it gets really soft. So while eating, the grated pieces will melt in your mouth. 2) Now using box grater start grating it. Keep the grated sweet potato into the bowl of cold water till needed.Alternately you can use food processor for grating job. 3) Heat the ghee in a pan on medium heat. Once hot add almonds and cashews. Fry till they are light brown in color. 4) Then drain the excess ghee and remove them into a small bowl or plate. 5) Now drain the water from sweet potato. In the remaining ghee, add that and mix. 6) Saute for 3-4 minutes. You will notice that it is starting to soften. 7) Now add milk and bring it to a simmer. 8) Continue simmering on low-medium heat for around 8-10 minutes or the milk is thickened. 9) Milk is thickened but still not the right kheer consistency. When you take a ladleful of it and pour it back. You will notice that milk and sweet potato stay separated. 11) Mix and continue cooking for 3-4 minutes. 12) Now add saffron and cardamom powder. Mix and cook for a minute. 13) Now check the kheer consistency. When you take ladleful and pour it back, you will see both will fall together, no more separation. This is perfect. If yours is not like this, continue cooking for couple of minute and then check again. 14) Then turn off the stove and add fried almond and cashews. You can serve this kheer warm. Or let it come to room temperature and then chill in the fridge and serve. Serving suggestion: Enjoy this as a dessert after your meal. 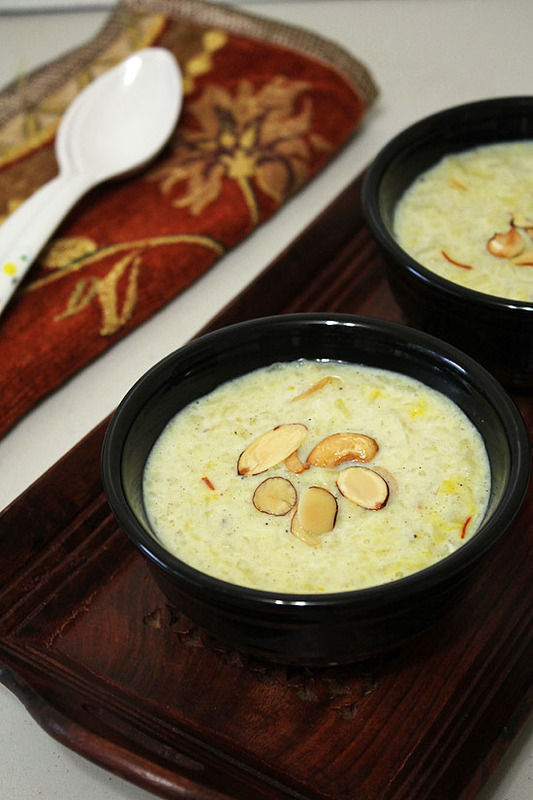 During Navratri vrat or upvas, this kheer can be consumed as a sweet. Now using box grater start grating it. Keep the grated sweet potato into the bowl of cold water till needed. Alternately you can use food processor for grating job. Once hot add almonds and cashews. Fry till they are light brown in color. Then drain the excess ghee and remove them into a small bowl or plate. Now drain the water from sweet potato. In the remaining ghee, add that and mix. Saute for 3-4 minutes. You will notice that it is starting to soften. Now add milk and bring it to a simmer. Continue simmering on low-medium heat for around 8-10 minutes or the milk is thickened. Now add sugar. Mix and continue cooking for 3-4 minutes. Now add saffron and cardamom powder. Mix and cook for a minute. Now check the kheer consistency. When you take ladleful and pour it back, you will see both will fall together, no more separation. This is perfect. If yours is not like this, continue cooking for couple of minute and then check again. add fried almond and cashews. You can also boil the sweet potatoes and blend them with sugar in a mixer blender and then boil them with slight milk. This gives it a very thick consistency , that of a rabdi.